We’d love your help. Let us know what’s wrong with this preview of Bear Likes Jam by Ciara Gavin. On the heels of Bear Is Not Tired comes a delicious new story of a big bear with an even bigger sweet tooth--perfect for fans of Karma Wilson's Bear Wants More. When Bear discovers jam for the time, he can't think of anything else. Mama Duck tells him that growing bears need to eat their vegetables first . . . but Bear can't stand the strange green things on his plate. He o On the heels of Bear Is Not Tired comes a delicious new story of a big bear with an even bigger sweet tooth--perfect for fans of Karma Wilson's Bear Wants More. When Bear discovers jam for the time, he can't think of anything else. Mama Duck tells him that growing bears need to eat their vegetables first . . . but Bear can't stand the strange green things on his plate. He only wants jam! It's not until Bear notices the little ducks around him eating ALL of their food, that it finally clicks: Bear can have his dinner and his jam. This tender follow-up to Bear Is Not Tired will hit home with every family of finicky eaters. To ask other readers questions about Bear Likes Jam, please sign up. This is the third book in the sweet series about a bear that lives with a flock of ducks. Bear discovers his love of jam and forgot to share it with the ducklings. He ate it late at night and during the day. Mama Duck worried that Bear wasn’t eating a balanced diet, even though Bear proved that he could balance very well. So she started trying to feed Bear vegetables at dinner with no jam. Bear refused to even taste them and went to bed hungry. Breakfast was oatmeal with no jam in sight. Dinner This is the third book in the sweet series about a bear that lives with a flock of ducks. Bear discovers his love of jam and forgot to share it with the ducklings. He ate it late at night and during the day. Mama Duck worried that Bear wasn’t eating a balanced diet, even though Bear proved that he could balance very well. So she started trying to feed Bear vegetables at dinner with no jam. Bear refused to even taste them and went to bed hungry. Breakfast was oatmeal with no jam in sight. Dinner came around with no jam either. But then the ducks showed Bear a new game! It was a game that got him eating vegetables without even noticing and then he was a happy bear because he could also have a jar or two of jam a day along with the ducks. Very cute book about eating your vegetables! Fun illustrations, but heavy-handed with its message. Hello, friends! 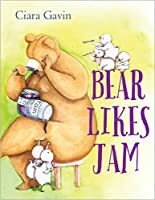 Today’s book is Bear Likes Jam by Ciara Gavin, an adorable tale about the importance of a balanced diet. Gavin’s lovely blended family of ducks and their beloved bear returns, with a new challenge to overcome. When Bear tries jam for the first time, he is hooked. Sometimes, he gets so excited that he forgets to share. Sometimes, he eats more than his fill, or even eats jam when he’s not supposed to, like after bedtime. Mother Duck is beginning to worry: growing bears should have healthy, balanced diets. She puts her webbed foot down: no more jam until Bear eats his vegetables. But Bear doesn’t like vegetables! He refuses to eat them, and goes to bed hungry. Can his adoptive family find a way to get Bear excited about healthy eating? This is the third book in Gavin’s Bear series, and we enjoyed it just as much as the last two. As always, the pen-and-watercolor illustrations are just adorable, and create wonderfully lively characters. The story here was great too: encouraging a balanced diet is always a good lesson for little ones, but I especially liked that it acknowledged that veggies just aren’t always delicious. The family encouraging healthy eating by making a game out of it felt more honest and, frankly, like a fun idea. The length is perfect for young readers, and JJ enjoyed it very much. A great addition to the series, and Baby Bookworm approved! I am excited that Ciara Gavin has a new story about Bear and the ducks, “Bear Likes Jam.” This time, bear struggles to have balance in his diet. According to the rules of Mama Duck, vegetables come “before” jam. You’ll love seeing how a cute trick made it happen, and Bear got to eat a jar or two of jam again. 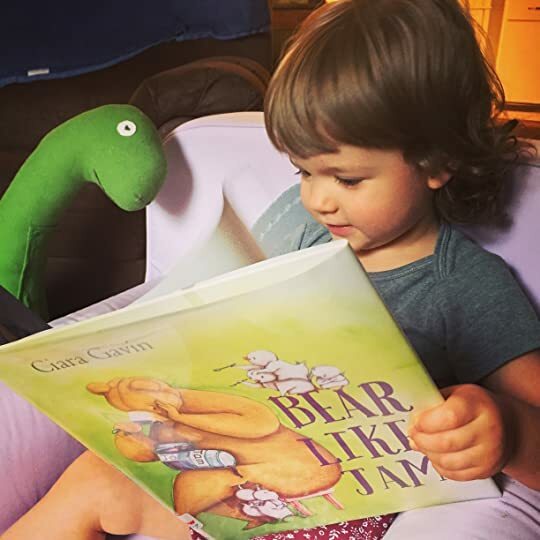 Endearing scenes created by Ciara return just as they did in her two previous books, “Room for Bear” and “Bear Is Not Tired”. I do love these books! Bear eats some jam, and discovers he likes it. He likes it so much that he refuses to eat anything else. His mother wants him to have a balanced diet, and forbids him to eat any more jam until he eats his vegetables. What's a bear to do? Simple and fun ways are implemented to make him eat his vegetables. Without being patronizing or boring, Gavin teaches kids that eating healthy is important and achievable! Watercolor illustrations not only hold the reader's attention, but add in humor. This book would be perfect for a food or bear themed story time. Bear doesn't want to eat vegetables only jam but Mama duck says no more jam until he eats vegetables. can his duck siblings help? Toddler and up. Loved this what a cute way to make eating vegetables fun. Another warm charming story about bear and his duck family. Here, Bear learns how to eat a balanced diet when the clarion call of jam is overwhelming. Bear loves jam so much he doesn't want to eat anything else. Mama bear says no more jam until he eats a balanced diet including vegetables. Will bear survive? This is a great book for picky eaters. One big picky eater learns that playing with your food makes even vegetables fun. Mama Duck insisted that Bear needed a balanced diet. He was not allowed to have any more jam until he ate his vegetables. The little ducks taught him some fun ways to eat his veggies so he could have some jam for dessert. Not as cute as the other two Bear books. Bear likes to eat jam so much that he doesn't really eat a balanced diet. When the ducks try to get Bear to eat other foods they aren't successful; it isn't until they make a game out of eating vegetables that Bear widens his food preferences. A simple story with some funny illustrations. Watercolor images. Sweet story. Sharing is caring. Cute, love the concept and the illustrations as always. Not as good as the other Bear books by Gavin. A cute continuation of Gavin's Bear series. 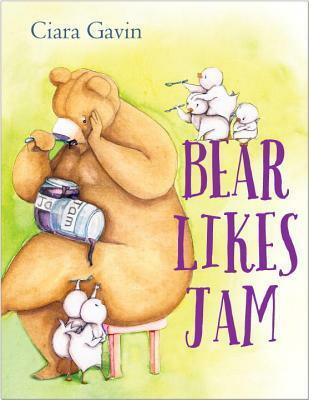 With adorable illustrations, this picture book share the story of bear who discovers a love of jam. Bear wants to eat jam and nothing else. On top of that, bear won't share the jam with the ducks! Great book about balanced diets, sharing, and kindness. The third Bear story by Gavin focuses on the poor eating habits of a bear that likes jam a little too much and vegetables not at all. Though a few tricks by his friends the ducks, the bear comes to appreciate a more balanced diet. A good book to share with a fussy eater at home or to address good nutrition at school. Bear loves jam but his duck friends teach him to eat a balanced diet of veggies and jam! Bear loves jam...Bear loves jam so much that Bear often forgets to share. Mama Ducks worries that Bear doesn't eat his vegetables so she tells him no more jam until he eats his veggies. At first this doesn't go so well...that is until there is a game! Great illustrations and great text. This will make a great storytime book! Thank you to Edelweiss and Knopf Books For Young Readers for early access to this title!!! Bear has to learn to refine his eating habits, a very nice story with a simple message.